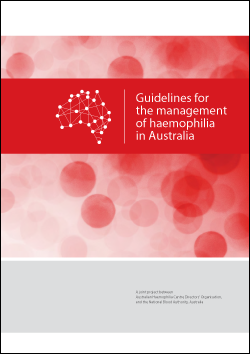 Developed by the Australian Haemophilia Centre Directors’ Organisation (AHCDO), in collaboration with the National Blood Authority (NBA), the Guidelines for the management of haemophilia in Australia are intended to provide practical, multidisciplinary guidance on the diagnosis and management of patients in Australia with haemophilia. The guidelines are based on the World Federation of Hemophilia’s (WFH) Guidelines for the management of hemophilia (2nd edition), but have been adapted for the Australian setting. Any significant changes from the WFH guidelines are listed at the beginning of each chapter, with further details of the adaptation process detailed in Appendix B. The guidelines were reviewed by a range of clinical experts before being released on 11 November 2015 for a six-week open public consultation process.